Try the GAF Home Designer Color & Style Guide! Choose between different shingle types/colors, trim and even siding. Even upload an image of your own home! Here to help you with ALL your roofing needs. We pride ourselves on quick response and quality advice. Offering all types of roofing service for any type of roof. Call for a same day estimate today! 7.49% x 144 months - Requires a 720 bureau score. We deal with and specialize in a wide variety of roofing materials from metal, tile, asphalt-composition, to cedar, TPO and even torchdown. We can also provide advice on each to help you decide what is right for you. Metal Roofs get a new image on Portland, OR homes! 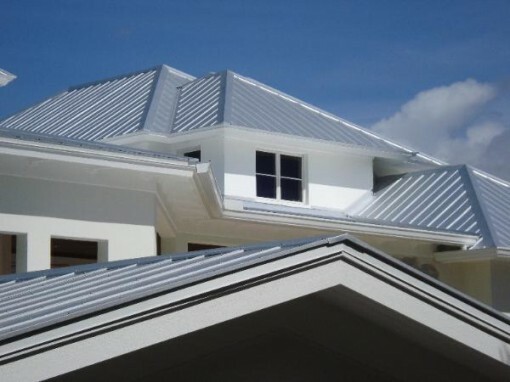 Metal roofs are not only for commercial buildings, shops and pole barns. Metal roofs can be just as attractive as they are practical. When shopping for a new roof, be sure to consider a free estimate for a metal roof. Metal Roofs are priced competitively, especially when taking their longevity into consideration. Adds beauty to your home. Is eligible for a 30% tax credit. Saves you money on maintenance costs. Will not allow moss buildup. Outlasts asphalt shingles by decades. Cost of ownership over time is less than any other type of roof. Has inherent energy saving benefits. Allows less heat tranfer saving you money on heating and cooling your home. Will never end up in a land fill; as metal always has, and always will be considered worth recycling. Is more compatible with roof top water collection & rain barrel systems. Metal roofs are one of the types of roofing materials eligible for a tax credit. A great choice for long term cost savings and the long term best choice for the Earth. Metal roofs can be made of totally recycled material and are produced locally. If you’re the type of person who really believes in doing everything you can to conserve the earth for future generations and want a tax credit, then a metal roof is the earth friendly choice for you. Even if you don’t care at all about saving the earth, the cost of a metal roof is a smart money saving choice. The initial cost of a metal roof will be more than a laminated asphalt shingles roof. Contact us to discuss the details specific to your roof. Copyright © 2019 The Portland Roofers. All Rights Reserved.